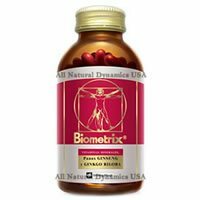 Biometrix vitamins are a multivitamin containing Ginseng, Gingko Biloba, vitamins and minerals to help improve the work and physical and mental performance of men and women. Biometrix contains Vitamins and Minerals in addition to two natural ingredients: Ginseng and Gingko Biloba to improve physical ability, fight fatigue and improve memory and concentration in men and women. Who Is Biometrix Recommended For? Biometrix vitamins with Ginseng and Ginkgo Biloba are recommended for women, men, seniors and students, as Biometrix helps improve memory capacity and mental concentration ability. Biometrix also helps improve physical and mental work in men and women. Currently, the pace of life is very busy for some people, this causes a high stress level. Moreover, most of us do not have a balanced diet so it is advisable to include a vitamin and minerals to achieve a proper nutritional balance.Biometrix, the multivitamin can help you have more vitality and better concentration. Vitamin A Palmitate..................................... 4,000 U.I. Acetate D, L alfatocoferol (vitamin E)..............30 U.I. * Supports the formation and maintenance of healthy teeth. * Production of red blood cells. * Their absence from the body produces fatigue. * Helps the nervous system. * Support the setting of calcium in bones. * Main antioxidant (for your skin, hair, heart). * Helps cell division and multiplication. * Their absence from the body produces anemia. * Fundamental to the growth of cells. * Helps the healing of wounds. * Required so that the immune system and antioxidant system work properly. * Helps keep bones and teeth strong and healthy. * Helps the heart function better. * Helps prevent muscle cramps. * Gives the body energy. * Helps improve memory capacity. * Improved ability to concentrate. Do not administer to children under 18 years old. Presentation: 1 Bottle with 100 Capsules.